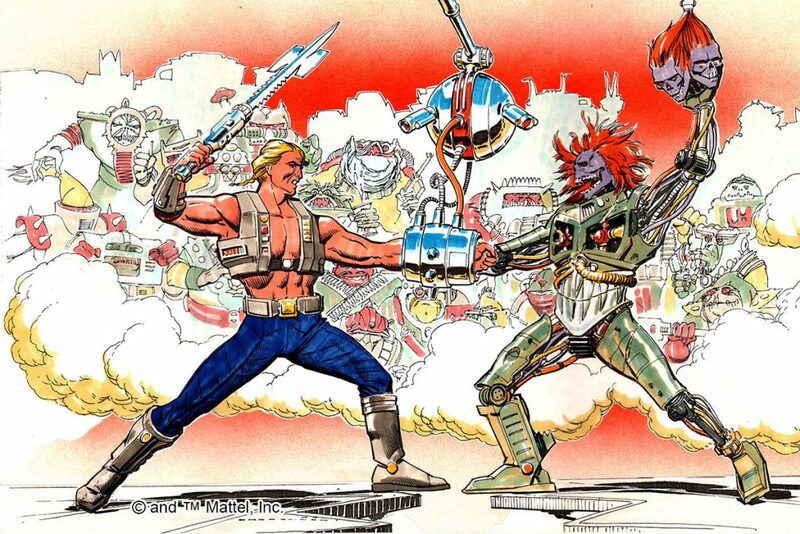 Battle Punch He-Man was the first He-Man variant in the “New Adventures” reboot of the He-Man series. The name “Battle Punch” implies some kind of action feature, although the figure had none. He did have some unusual articulation that was marketed as a kind of action feature, but I’ll get into that just a bit later. 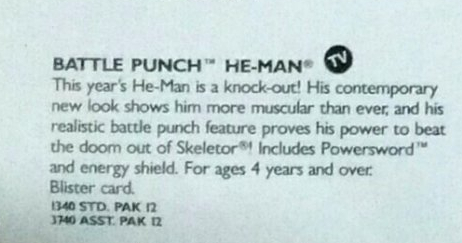 Battle Punch He-Man seems to have been designed by Mark Taylor, who also designed the original He-Man released in 1982. 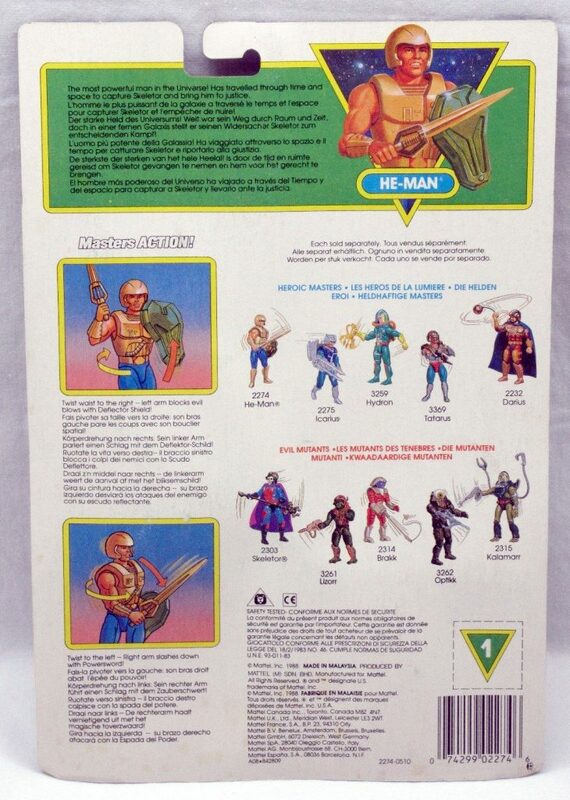 Shortly after the successful launch of the original Masters of the Universe toyline, Mark left Mattel (eventually working on the wildly successful Teenage Mutant Ninja Turtles toyline), but he returned as a vice president at about the time that New Adventures line was going full steam. 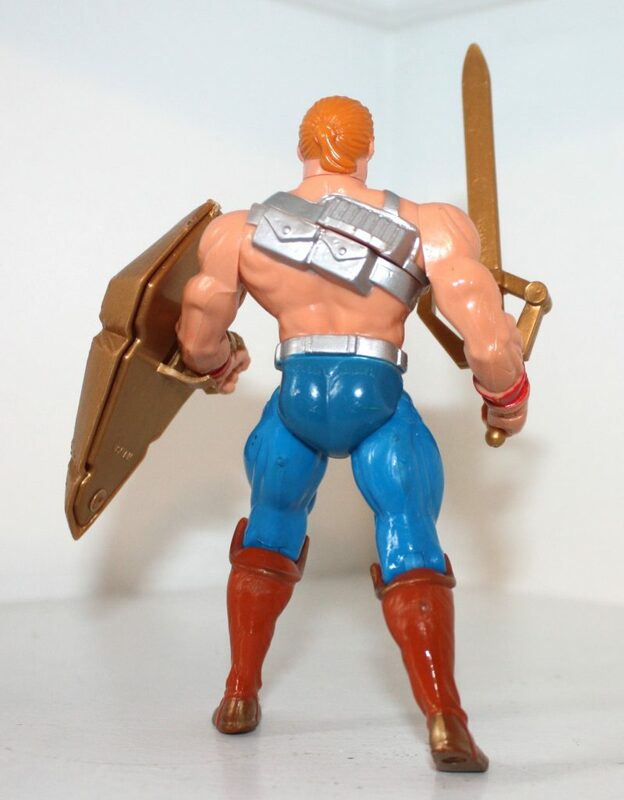 Mark Taylor’s design (above) has some of the broad elements that made it to the final toy, including the specific look of the boots and the sash around his torso. 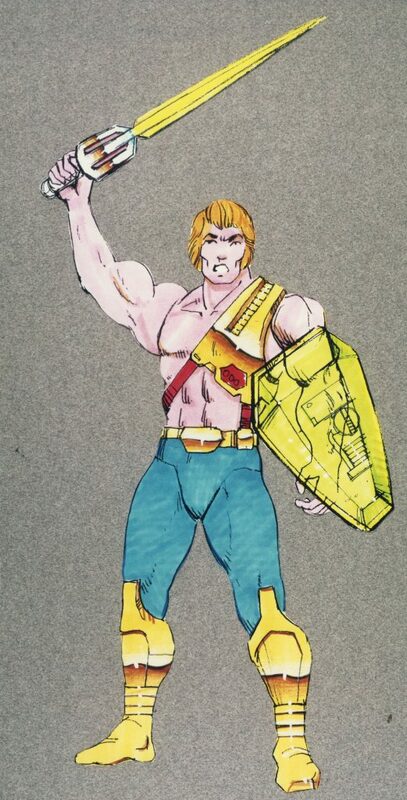 However, Mark’s design seems to depict a rather disheveled He-Man, with torn clothing and gauze wrap around his fists. He looks like a street fighter rather than a space fighter. 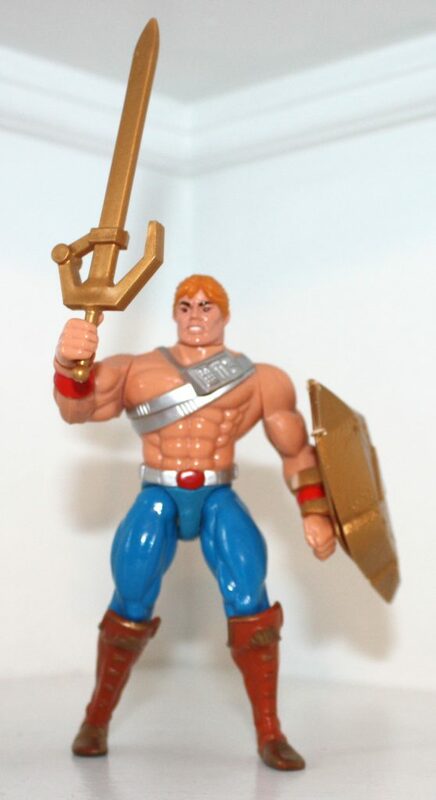 In some ways, Battle Punch He-Man is actually closer to the look of He-Man as he appeared in the Jetlag New Adventures of He-Man animated series than was the 1989 release of He-Man. 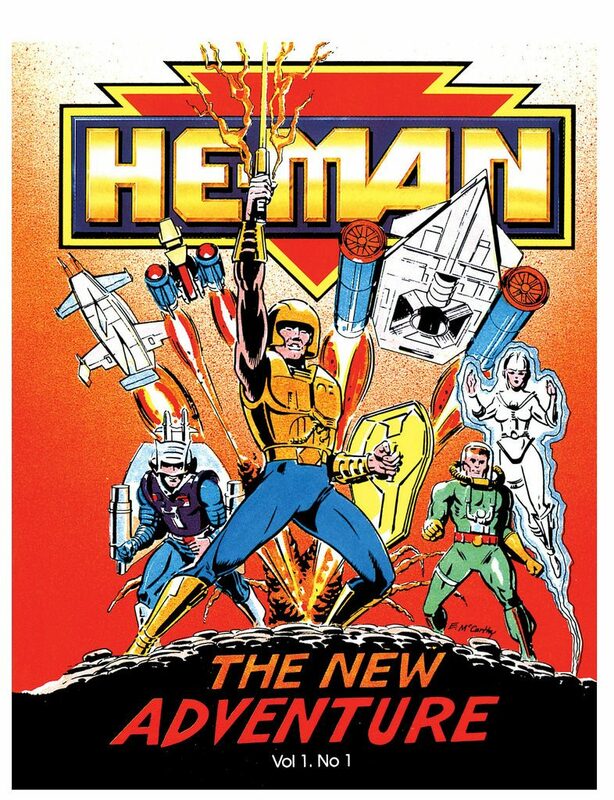 That might have been coordinated, as the New Adventures series was released the the year before Battle Punch He-Man. 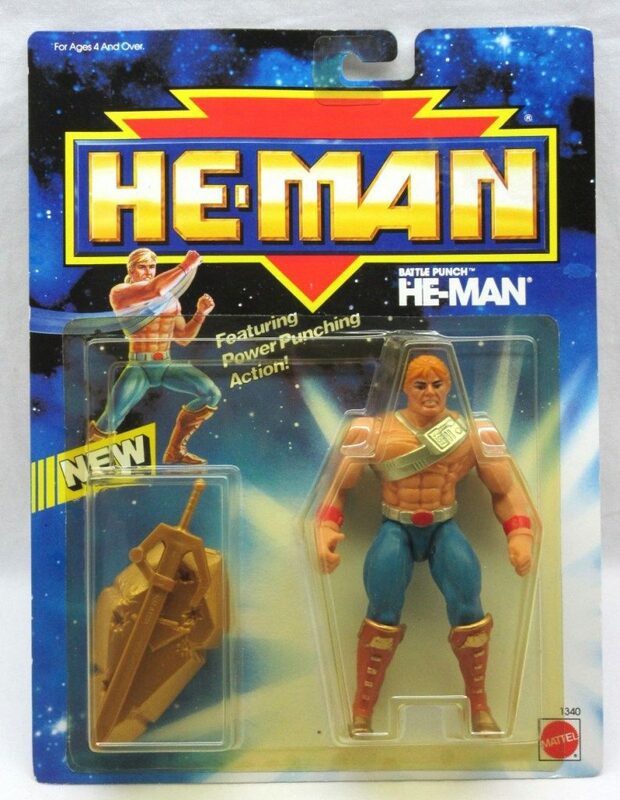 The animated version essentially looks like Battle Punch He-Man with the sword (and occasionally, shield) of the 1989 release, but in gold. 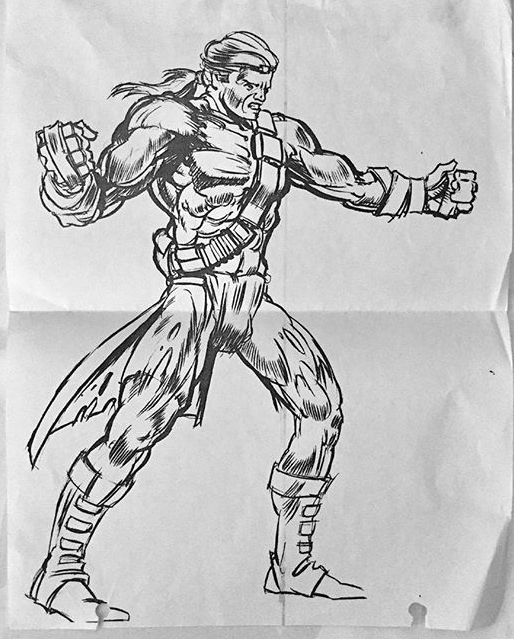 We can see the further development of the figure design in the artwork below (artist unknown), first shown in Mattel’s 2009 SDCC Art Book. The concept art below is pretty close to the look of the final figure, with the exception of the shield. 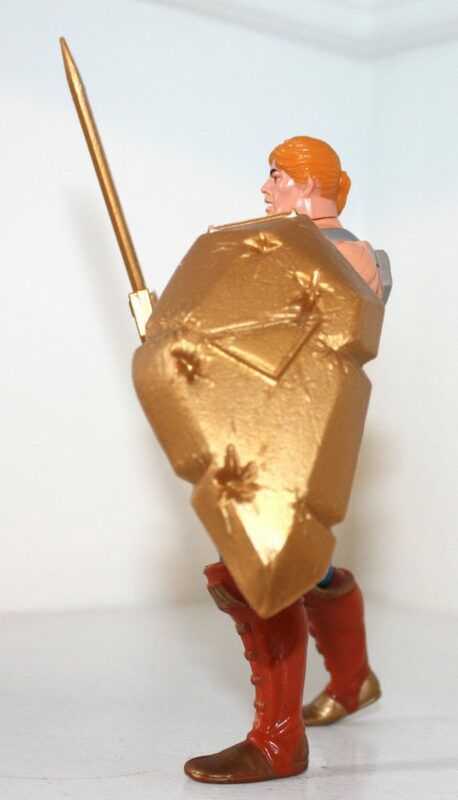 The shield has a stylized bird design on it, while the production shield would have the “New Adventures” He-Man triangular logo on it as as well as some sculpted battle damage. 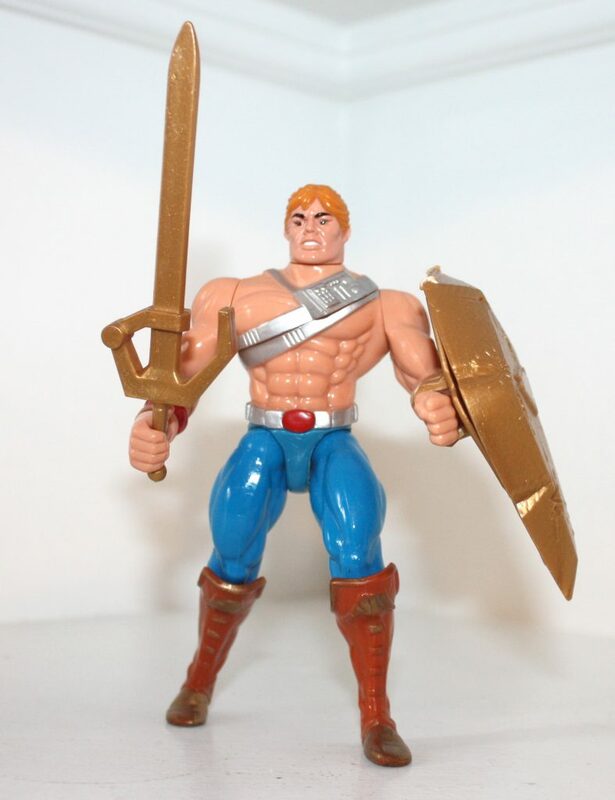 He-Man was given a new power sword as well, with an asymmetrical hilt design. 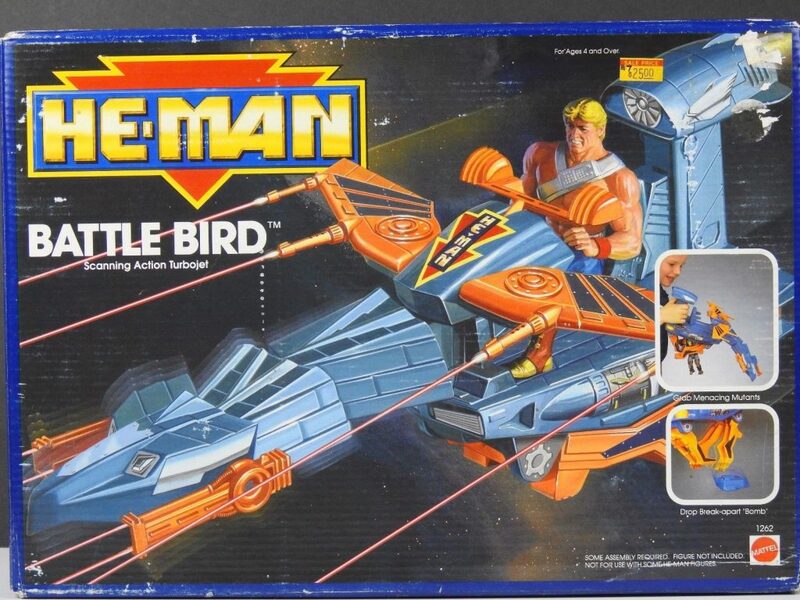 Battle Punch He-Man with the unreleased Clawber bird. 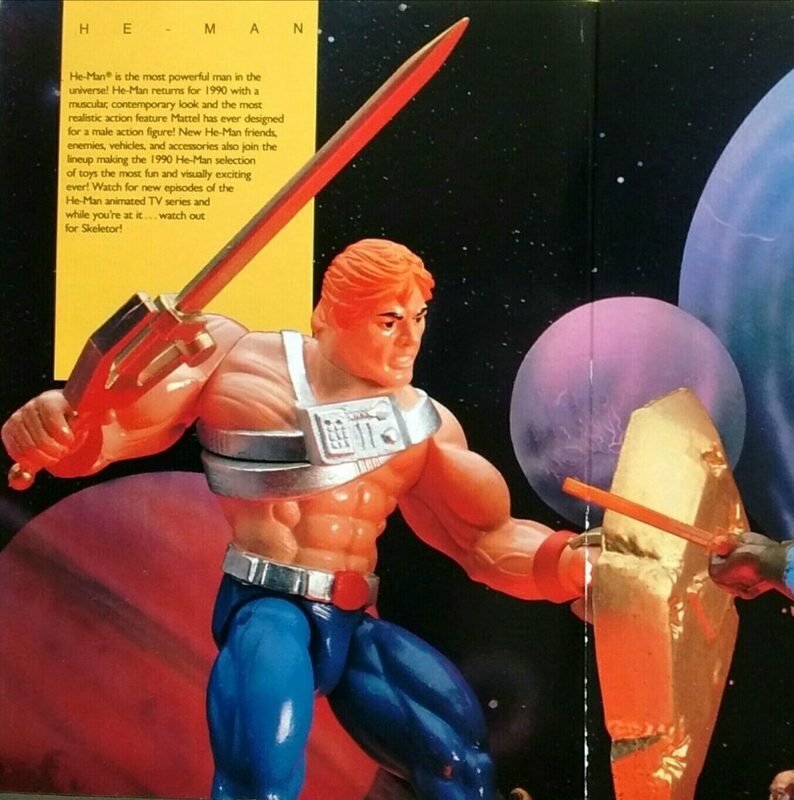 Battle Punch He-Man is slightly bigger and bulkier compared to the 1989 version. He has some of the same standard articulation that most figures in the series had, including ball joints at the knees and hips. His main feature, however, was a diagonal articulation joint across his chest, which allowed you to manually wind him up for a punch (there was no spring-back action, so the entire action was manual), while making the figure look completely bizarre in the process. Used subtly, however, the articulation can slightly alter his pose and posture in useful ways. 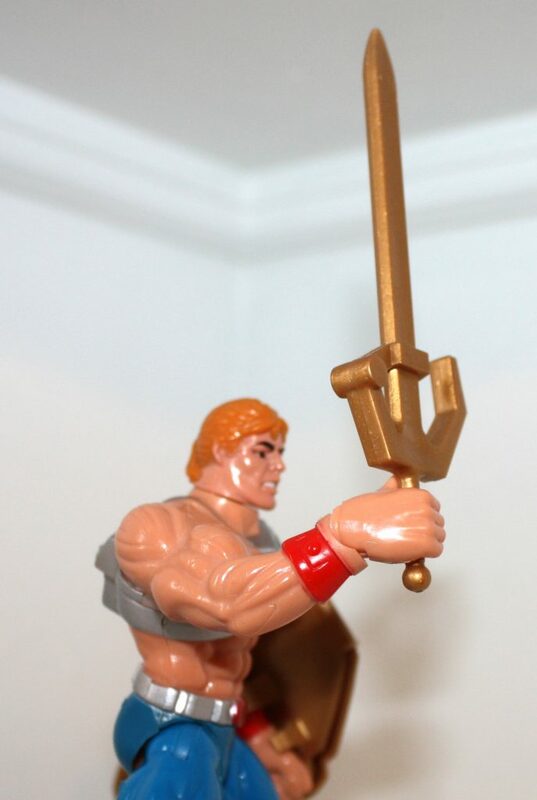 The figure also featured a more pragmatic bit of articulation – a hinge joint at the wrist, allowing him to realistically hold his sword aloft for the first time. 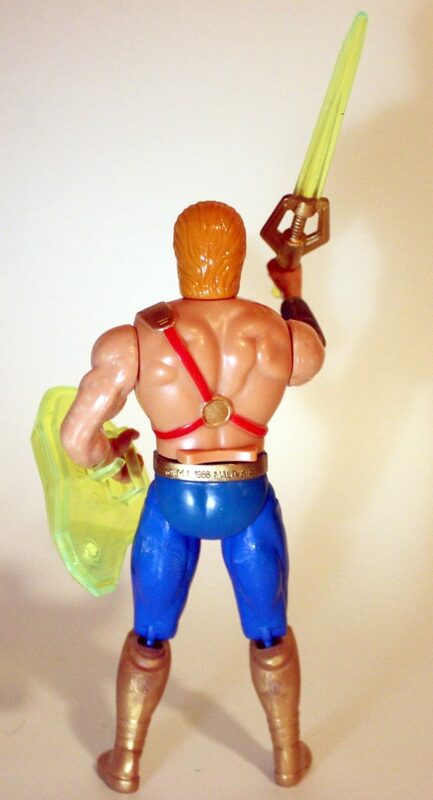 Unlike the 1989 He-Man release, this version has a sculpted pony tail, which conforms to the Mark Taylor concept art as well as the animated depiction. The packaging for Battle Punch Figure features artwork on the front by (I believe) William George. I’m not sure who did the art and instructions on the back. 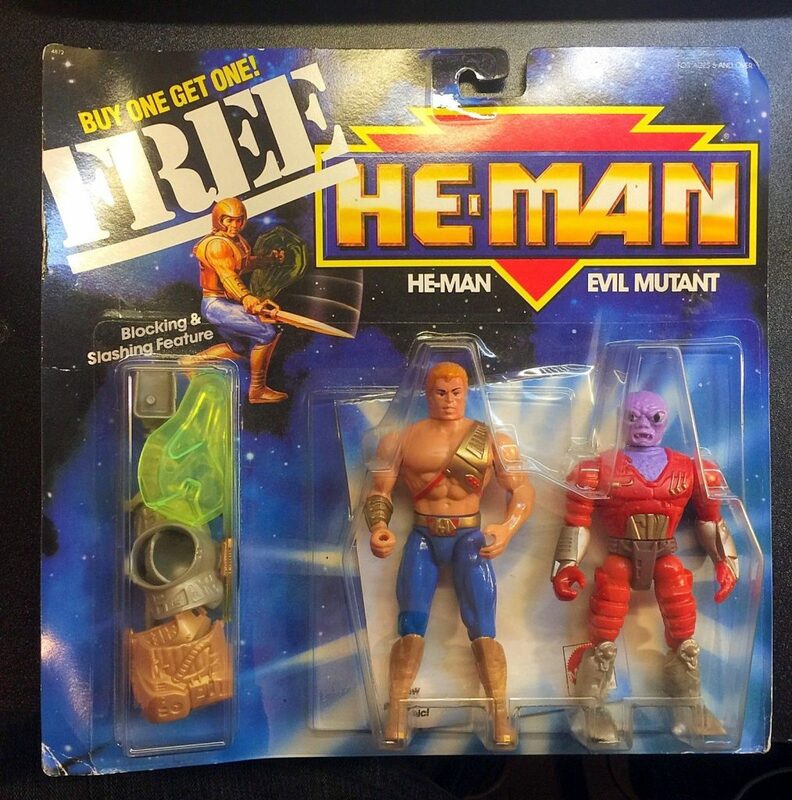 The most powerful man in the universe! 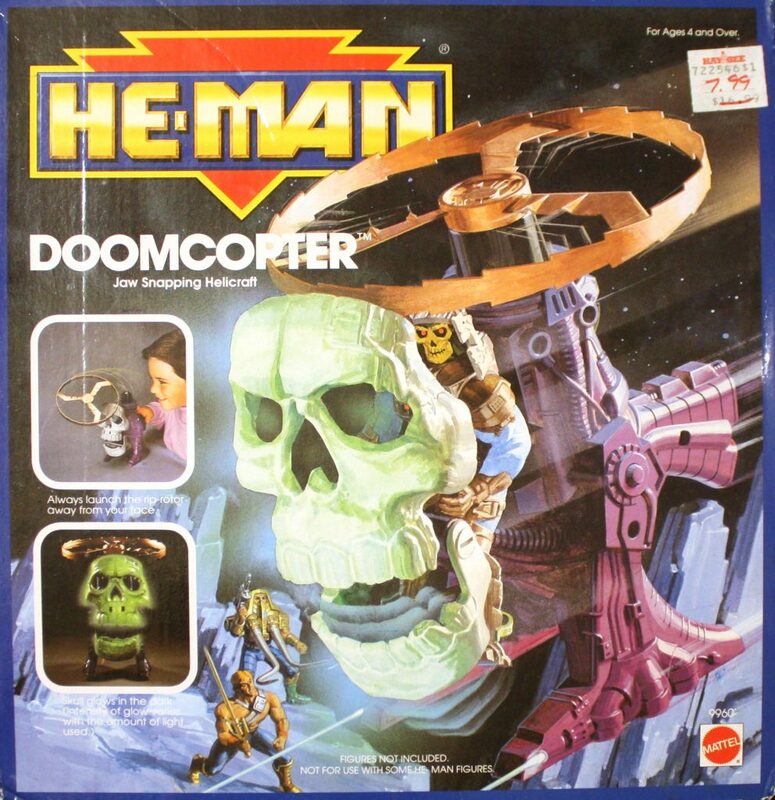 Only He-Man, with his ultra-energized sword and shield, can defeat Skeletor’s new weapons – the Disks of Doom. 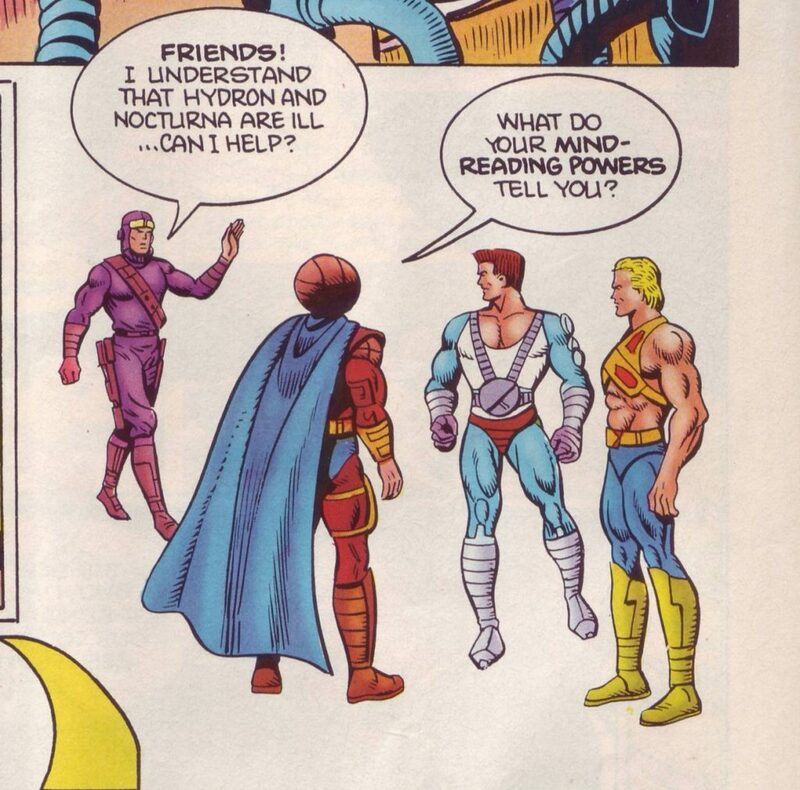 A stranger stranded in a strange place and time, He-Man has a lot to learn about the future world of Primus. 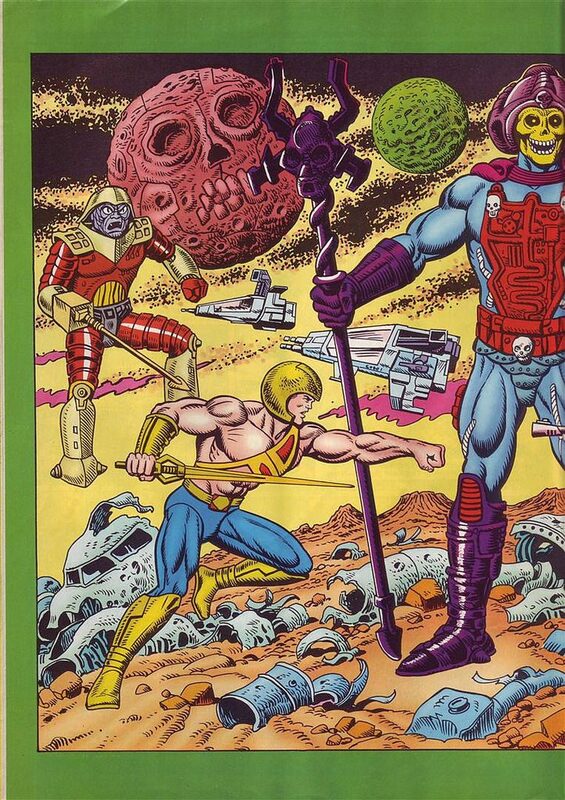 And, the gentle people of this peace-loving planet have a lot to learn about the evil of Skeletor from He-Man. 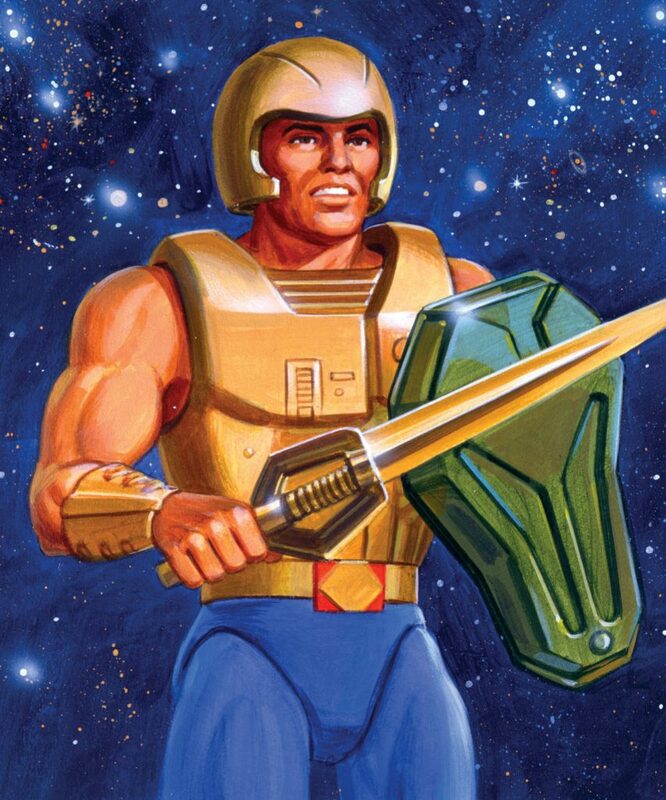 Mission – To unite the Tri-Solar System against Skeletor and lead a star-legion of Galactic Guardians into combat to defend the last great civilization of mankind. 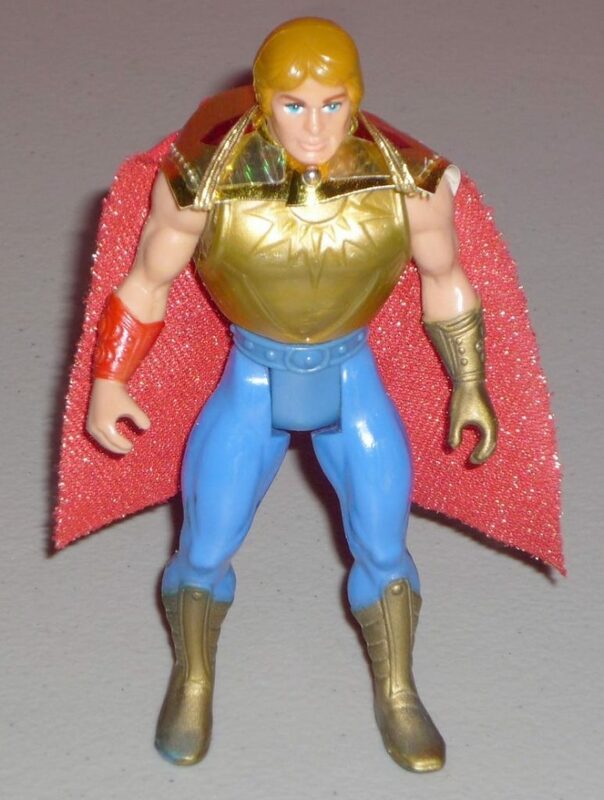 I can’t imagine any kid had hours of fun playing with that particular feature, but I do think in terms of his overall costume design he is the best looking of the three “New Adventures” He-Man figures. Unfortunately I haven’t identified a lot of media associated with this variant. If I come across any comics or additional catalogs featuring the figure, I will certainly update this piece to include them. 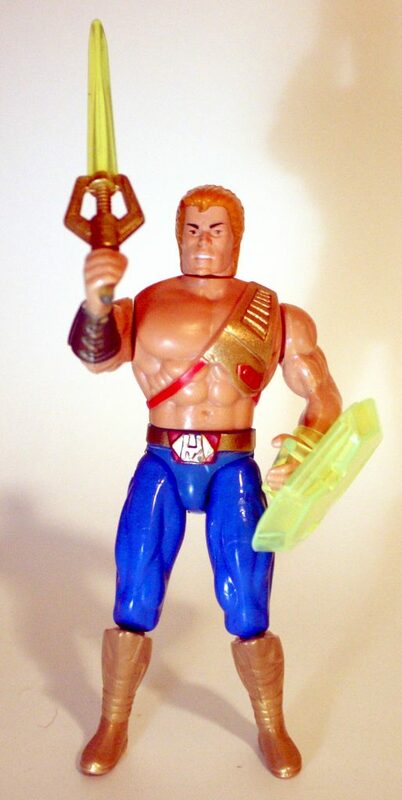 The 1989 He-Man reboot is often considered by most fans to be a failure. It’s true that the line was less commercially successful than the original line (a high bar to clear). 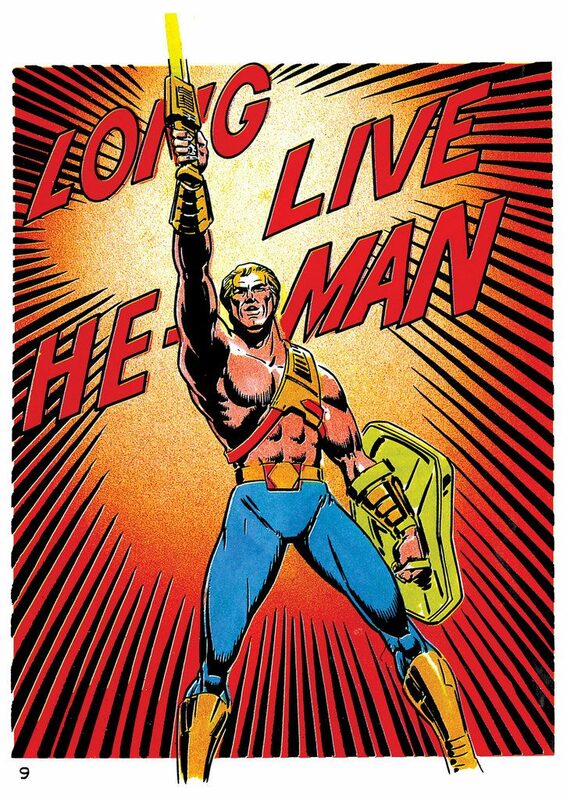 On the other hand, the rebooted “He-Man in space” line lasted for four years – twice as long as the more popular 200x reboot. So, perhaps it’s not fair to call it a failure. I was never a fan of the “New Adventures” reboot, until one day I was. 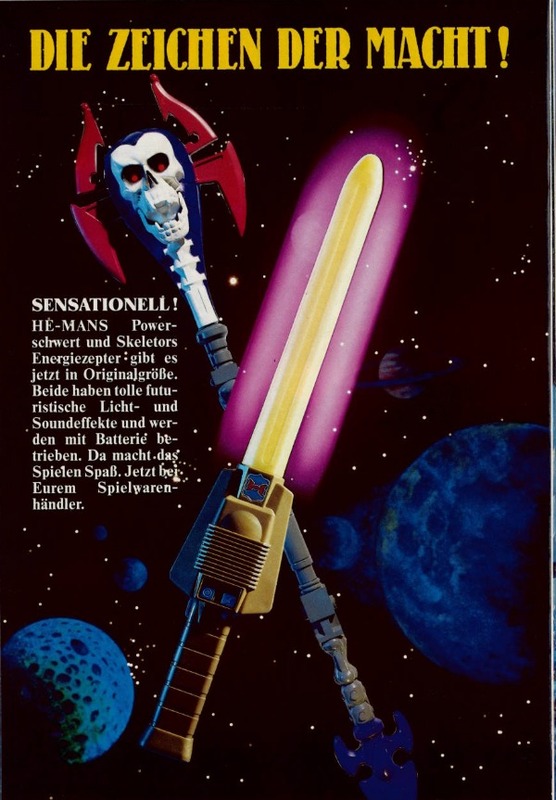 I think it was a sudden and intense interest in Laser Light Skeletor that drew me in that direction. Still, while I love most of the evil characters in the 1989 line, most of the heroes are a bit under-cooked for my tastes. 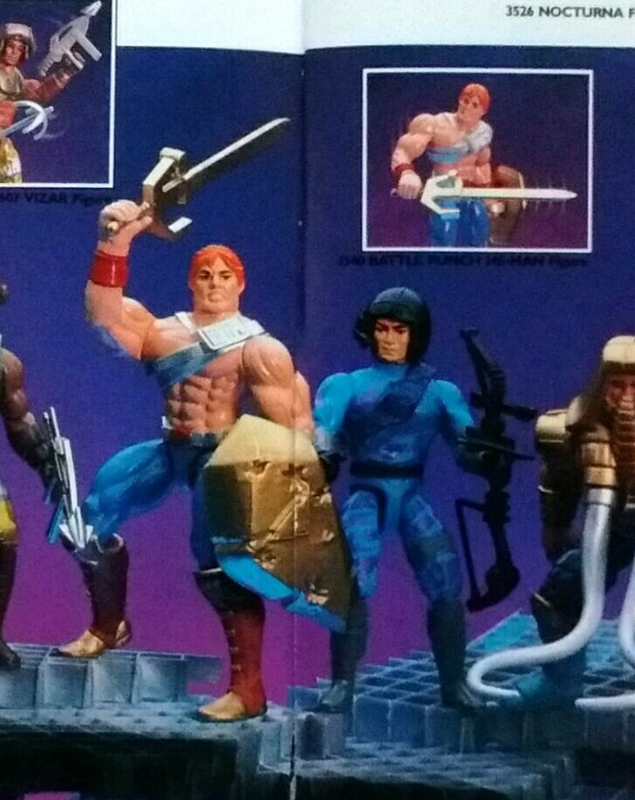 My theory is that they kept the heroes more generic-looking so that they could be reused for other toylines (and indeed, several of them were reused in Mattel’s Demolition Man toyline). 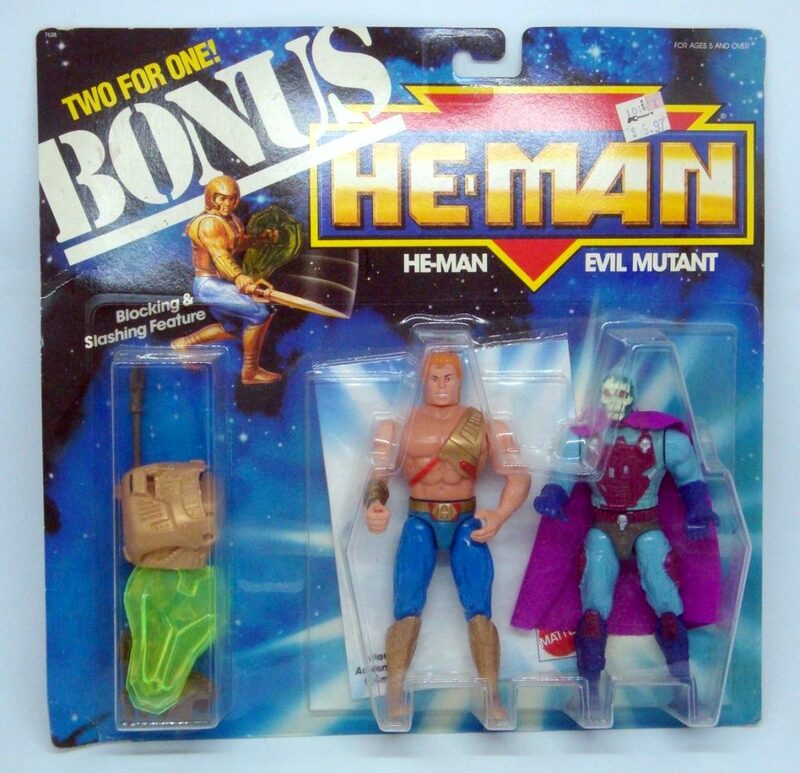 I remember running into this toyline on the shelves and thinking “that’s not He-Man” and walking away. 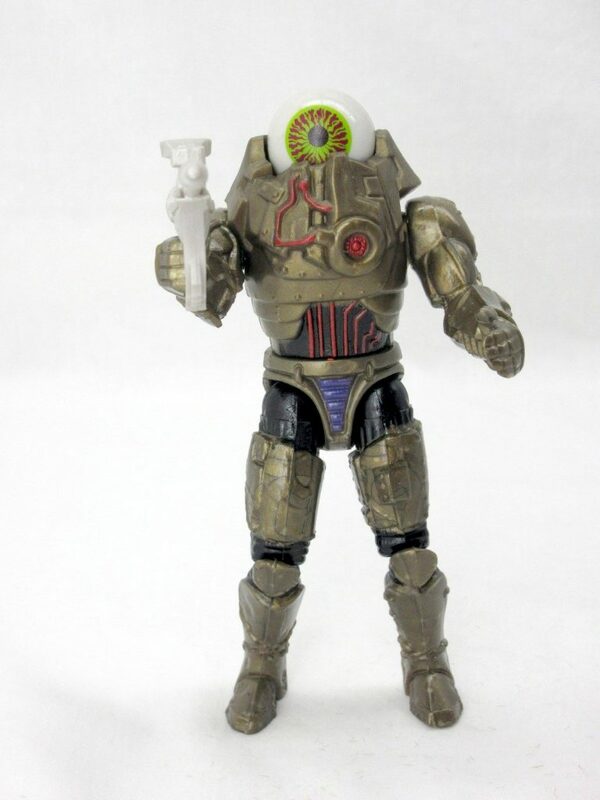 I’m sure that’s not the reaction Mattel was going for. At the time I was reluctantly collecting Teenage Mutant Ninja Turtles – reluctantly, because I considered myself too old for toys. Little did I know. 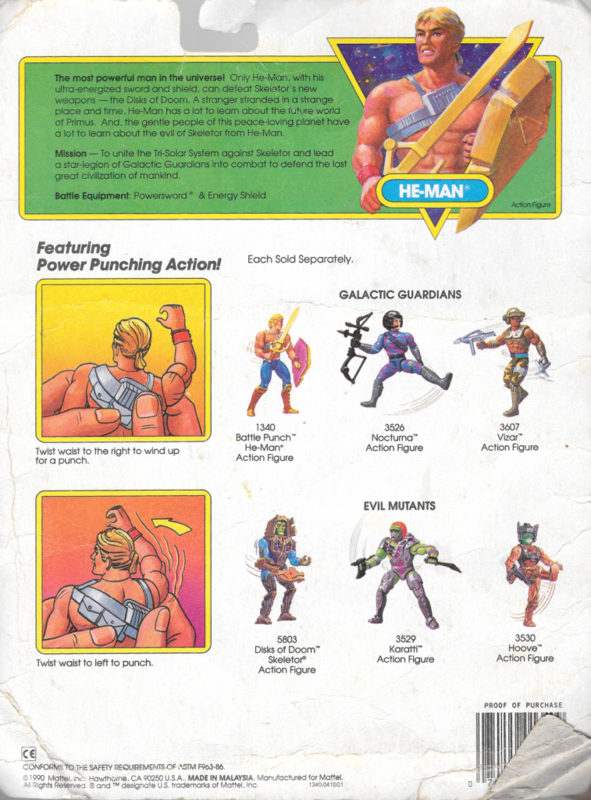 The 1989 edition of He-Man was designed by Martin Arriola. 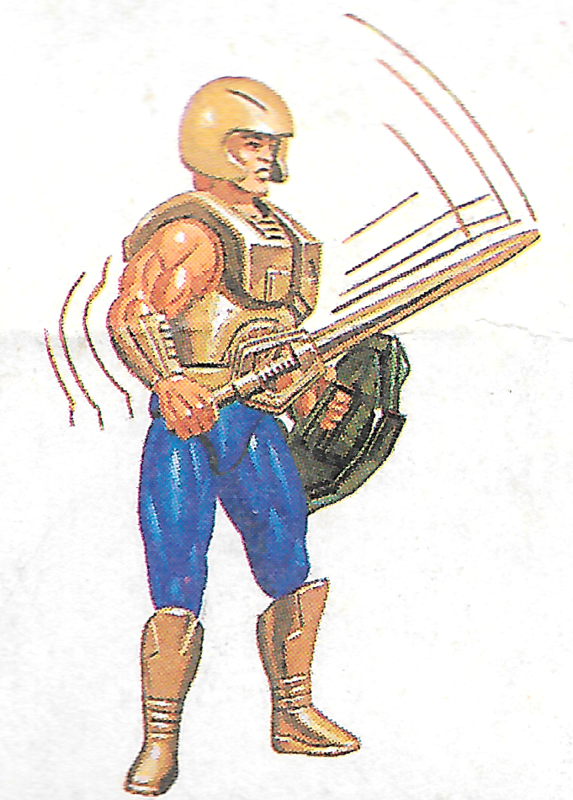 Two versions of the concept art were shared in Dark Horse’s Art of He-Man book, depicting the figure with and without his snap-on armor and gold helmet. 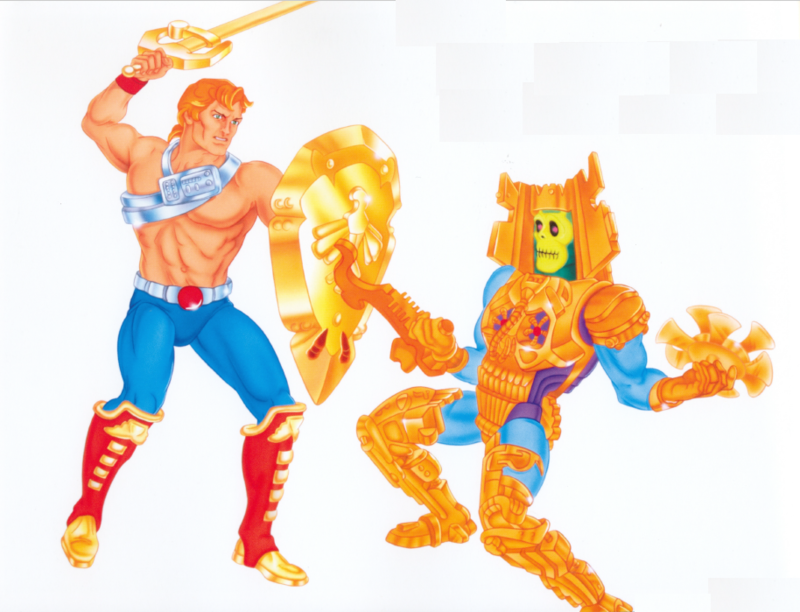 Unlike the “New Adventures” Skeletor, this He-Man would have almost no visual references to any previous version of the character. 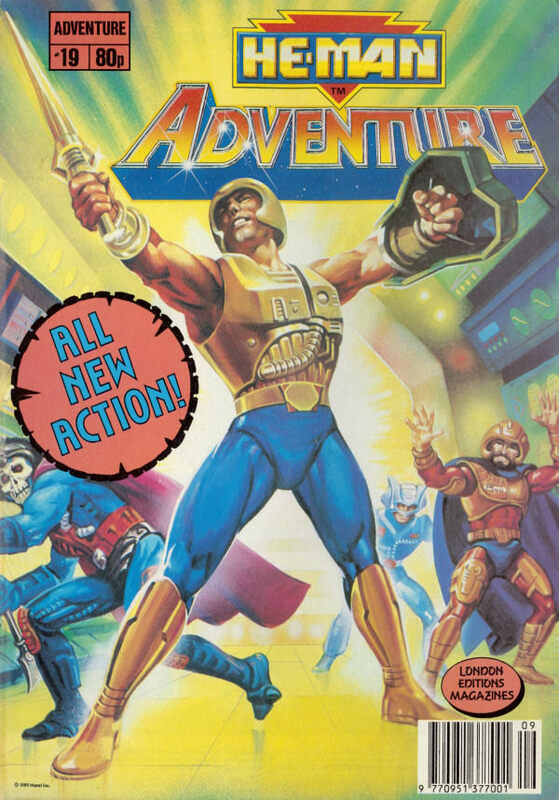 He’s got gold boots, blue pants, a totally redesigned sword and shield, redesigned harness, and a retro-futuristic armor and helmet. 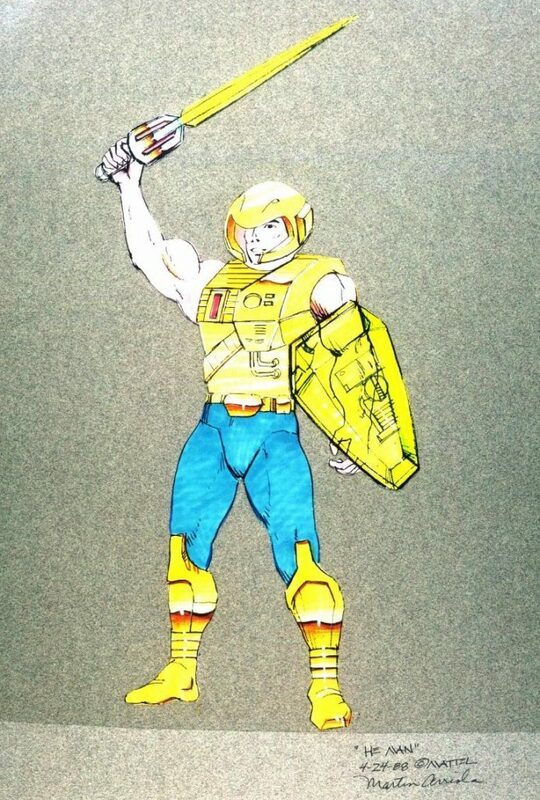 Without any context, I don’t think anyone would immediately connect this design to He-Man, which is I think one of the areas where the reboot went astray. That’s not to say that it’s a bad design – it’s a pretty neat space adventurer design. 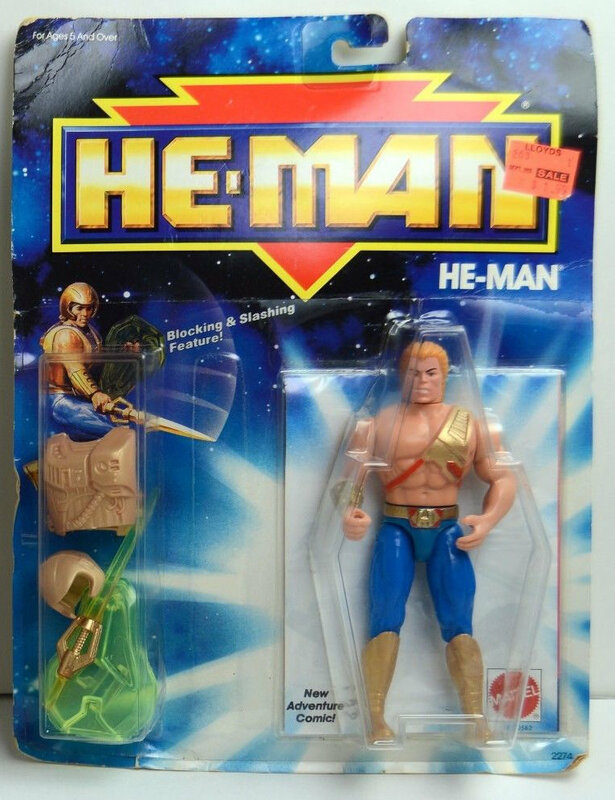 But is it He-Man? 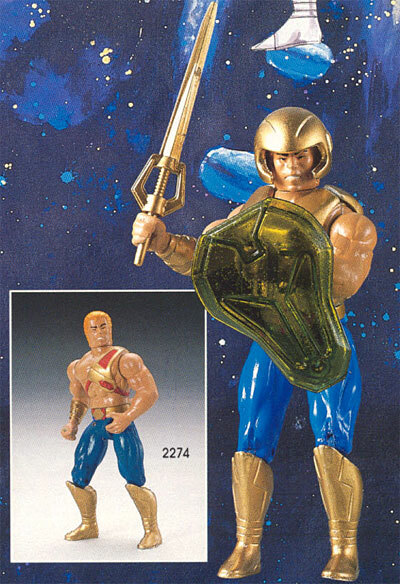 The idea for the shield and probably the sword seems to have been to use clear plastic (giving it something of a connection to the previous year’s Laser Power He-Man). 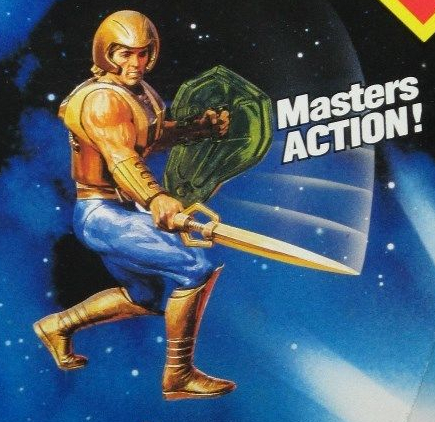 However, in prototypes that showed up in catalog artwork, we see a solid gold sword and a dark, transparent shield. 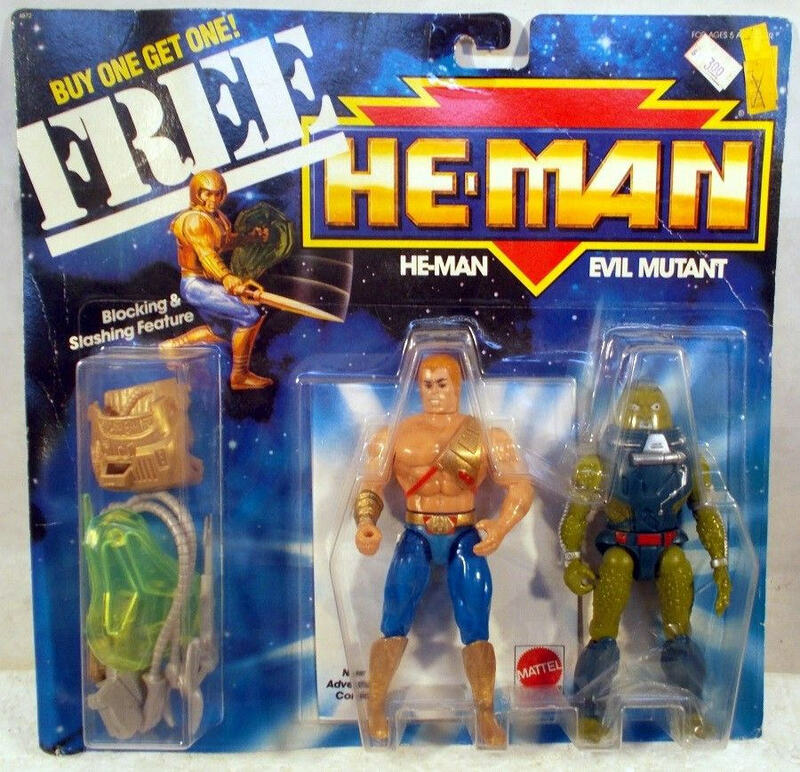 He-Man cross sell artwork. 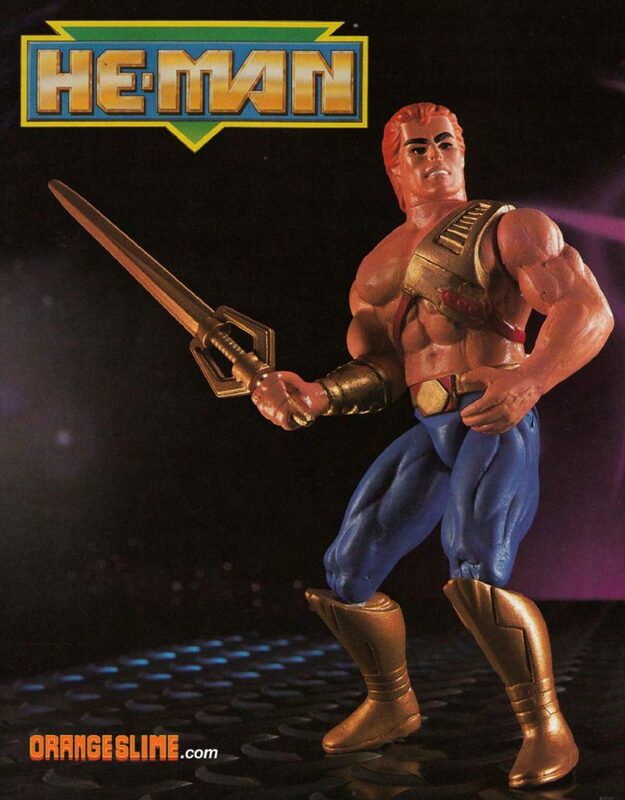 As indicated by the artwork, twisting his waist would make He-Man either slash his sword or raise his shield. The final toy seems to use LISA (light collecting) plastic in the sword and shield, which were also used in Lego sets around that time. 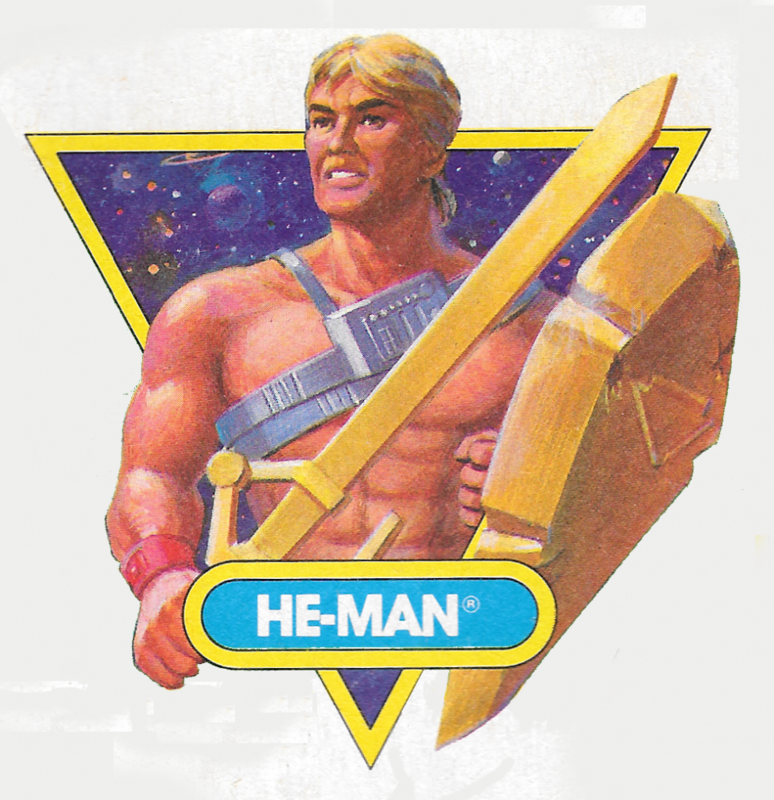 The figure also has a combined H/M symbol added to his belt, a feature not present in the concept art or prototype. 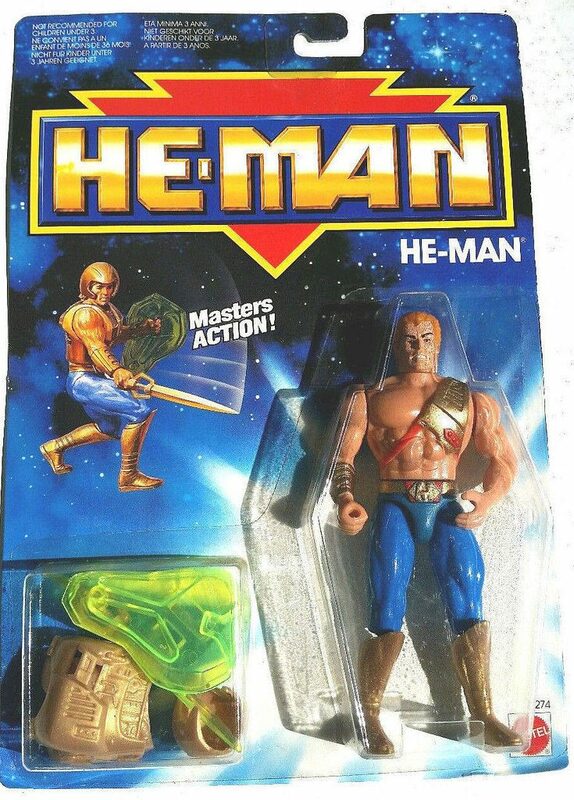 The face does resemble the original 1982 He-Man’s face, but it’s subtle enough that it would be easy to miss that this was a He-Man figure, with no other visual references to previous versions. 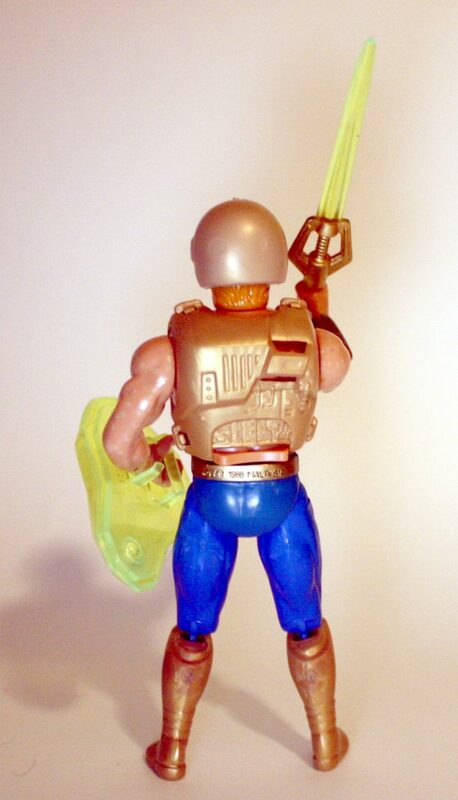 The figure could be displayed with or without the snap-on armor and helmet. 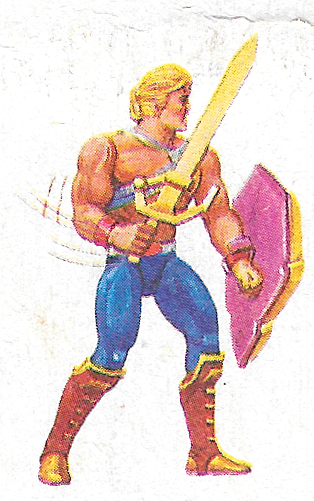 He-Man was sold in a number of configurations: a single card, or in giftset with either Skeletor, Flogg or Slushhead.The design of the single card’s bubble is a bit little different on the Euro card, which has a smaller section for He-Man’s accessories. 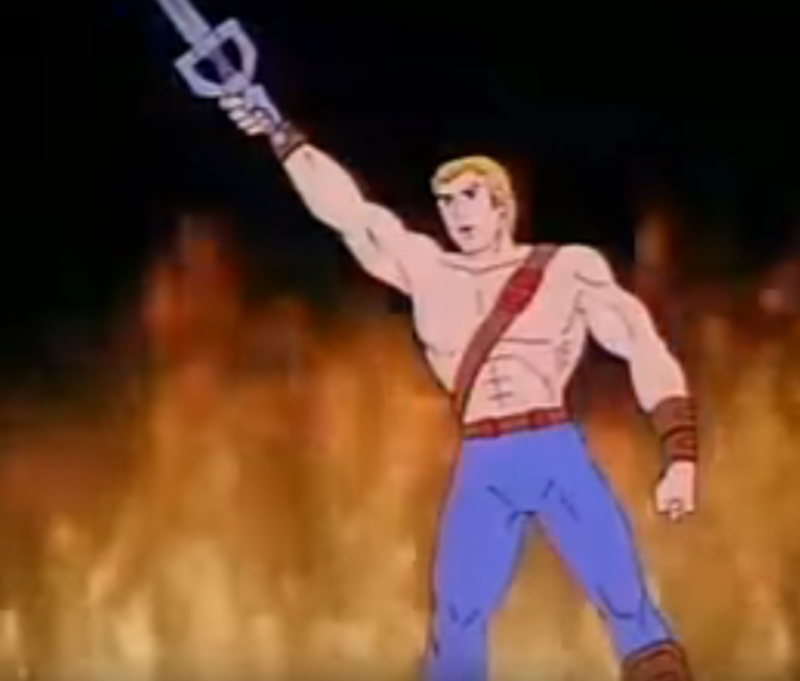 As mentioned previously, Mattel had planned to ask Filmation (the studio that had produced the first He-Man cartoon) to make a cartoon series for the He-Man reboot. 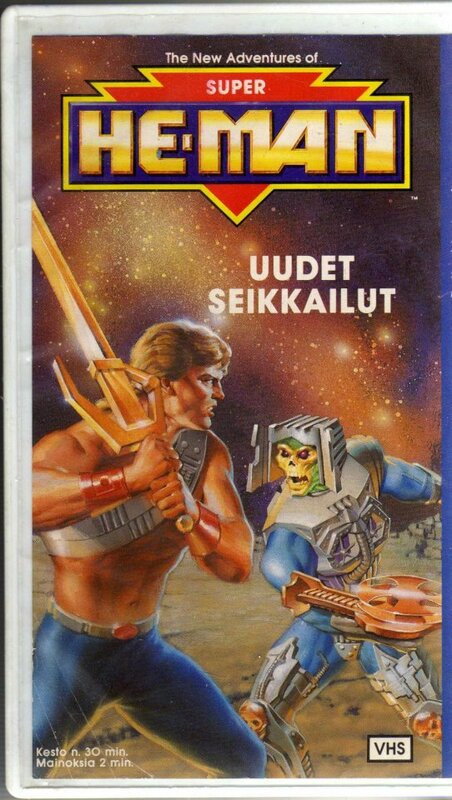 Its title would have been He-Man and the Masters of Space (information via Dušan M./James Eatock). 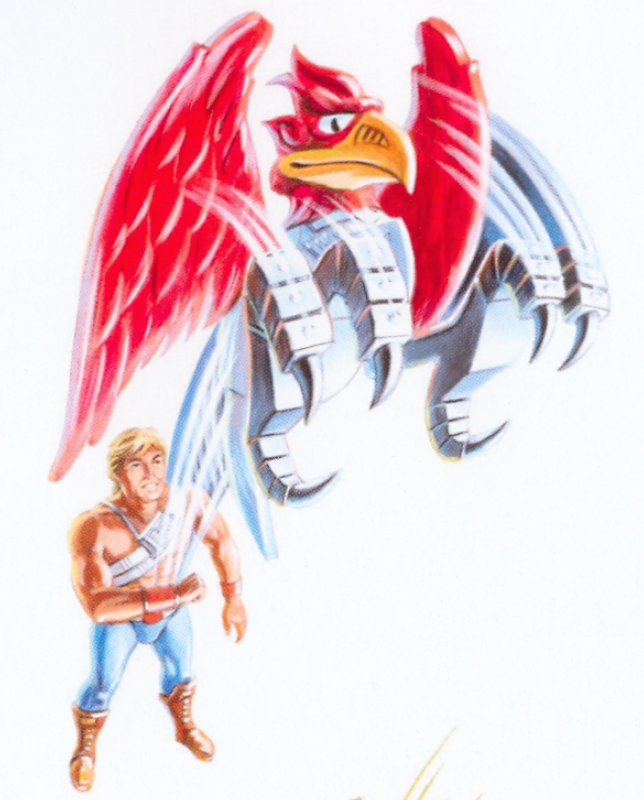 Filmation went out of business in 1989, but they did create some artwork and a basic storyline for the pitch. 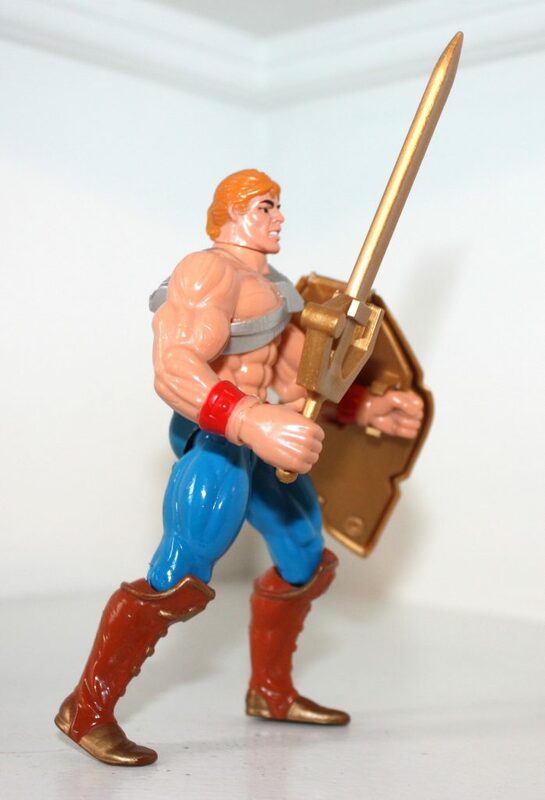 He-Man’s look here more or less follows the design of the toy, although he has a solid gold sword like the prototype, as well as some additional red detail. 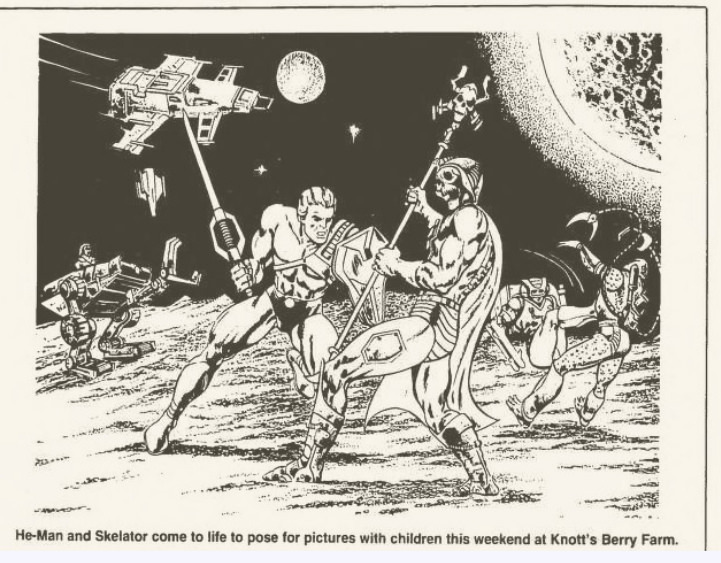 Image via the Ancient Library of Grayskull Facebook group/Dušan M.
Filmation tended to prefer symmetrical character designs, allowing them to flip cells over reuse them in the reverse pose. To that end, this look was also created. 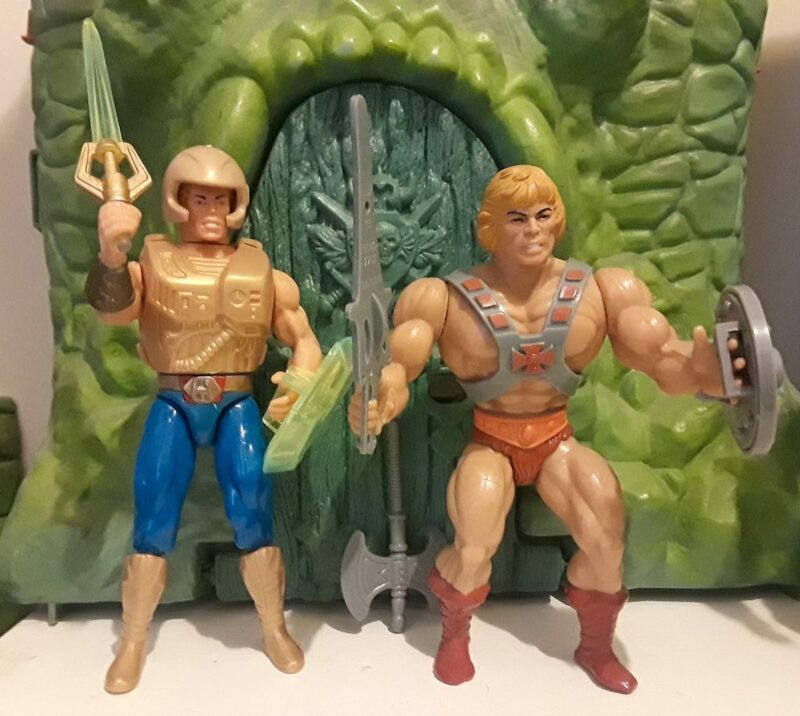 For more information on some of the details of Filmation’s vision for the reboot, see this post at the Ancient Library of Grayskull Facebook group. Or, check out cereal:geek issue 14. After Filmation went out of business, the job of animating the series went to Jetlag. 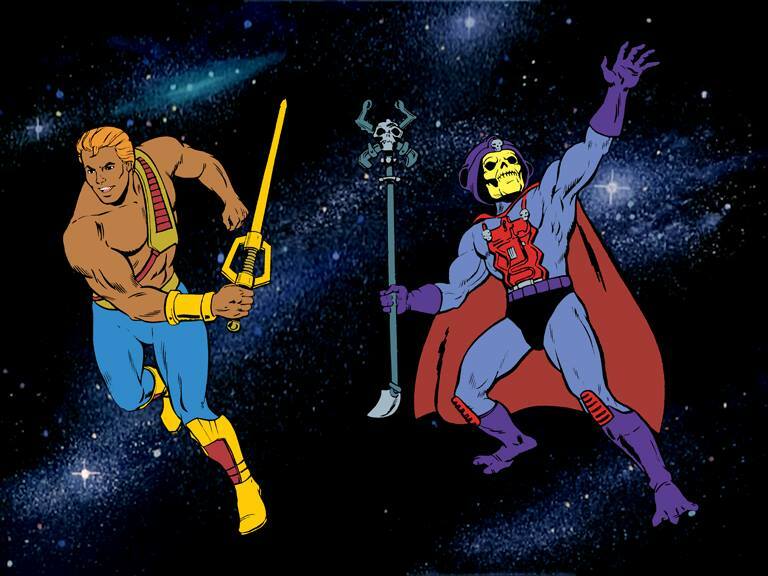 The series starts off on Eternia, before He-Man and Skeletor are whisked off into the future, but both of them already sport their New Adventures costumes. 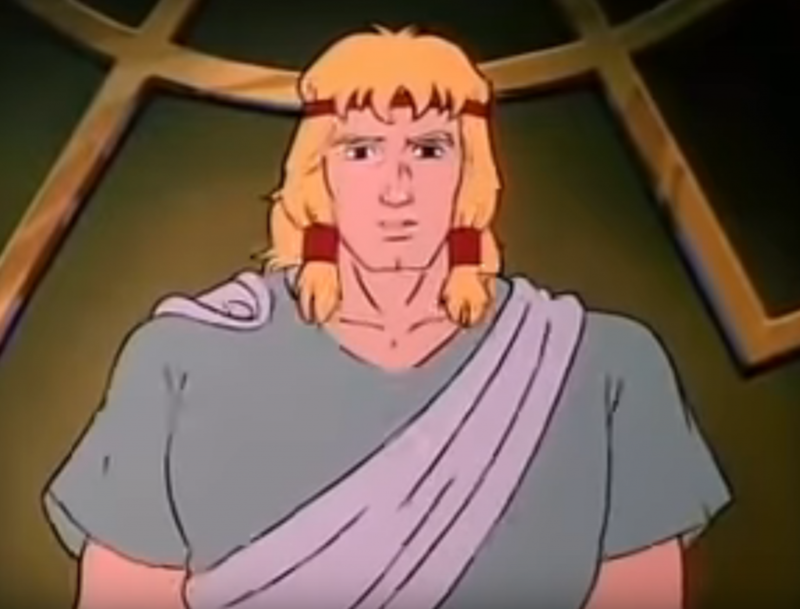 Startlingly, after getting a warning from the Sorceress, a redesigned Prince Adam transforms into He-Man right in front of his parents, who hadn’t been aware of his secret identity previously. 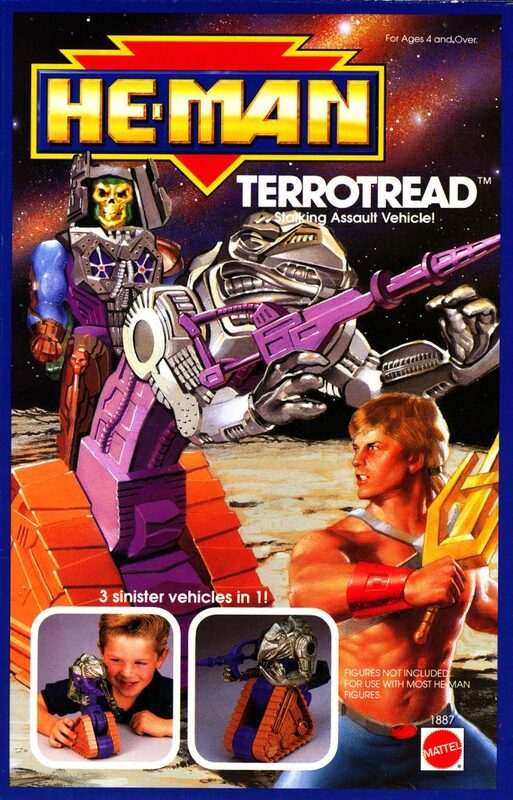 From there he rescues Hydron and Flipshot from Skeletor’s clutches, and returns with them to the future to save Primus from the mutants. The Jetlag version of the character I think looks a bit better than the action figure, at least color-wise. In my opinion the brown works much better with blue than gold does. Even his sword is silver rather than gold. But I’ve always had a weird bias against blue and gold together. 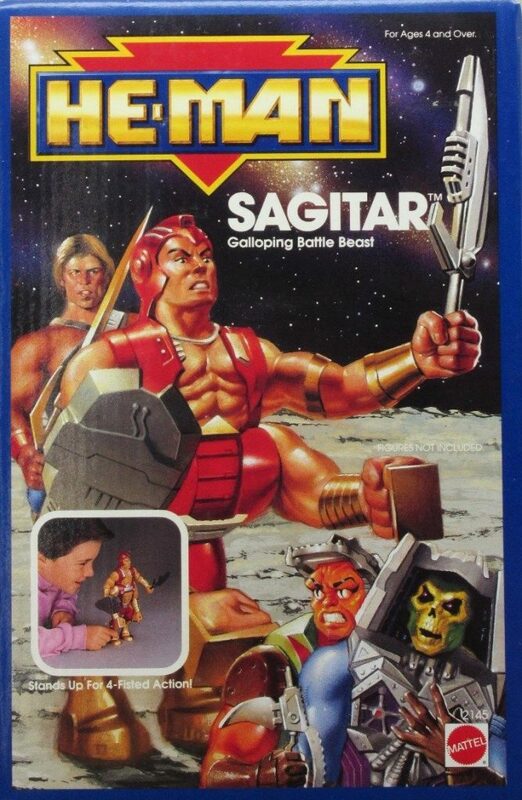 He is not the all-powerful collossus as depicted in the Filmation series. He has to struggle to defeat even ordinary villains. Strength-wise, he’s very similar to He-Man as depicted in the 1987 Masters of the Universe movie. 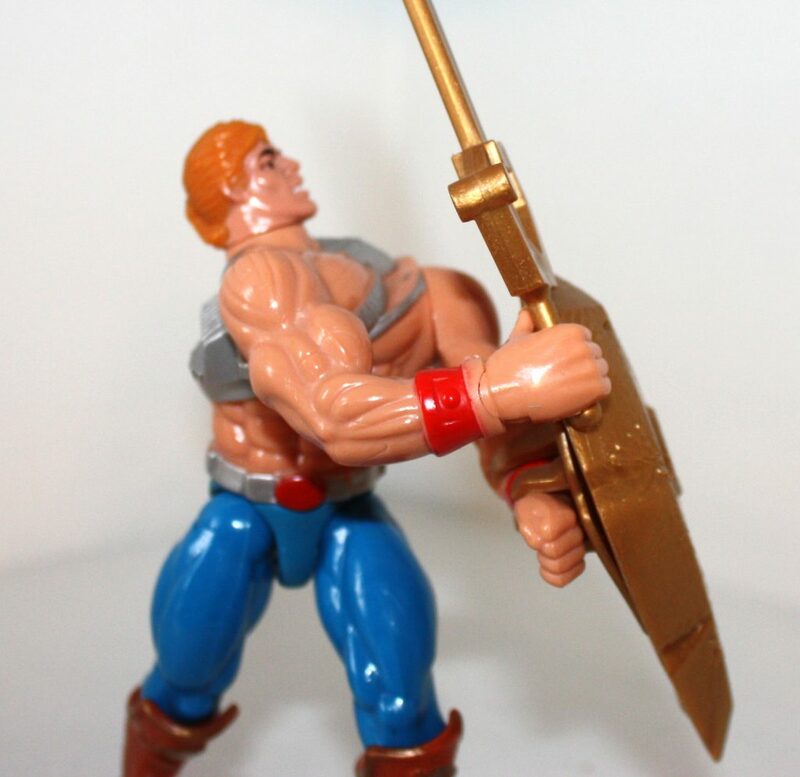 He-Man very rarely has his shield in the Jetlag series, but when he does, it resembles the dark prototype version. Mattel put out four minicomics for the series, illustrated by three different authors. 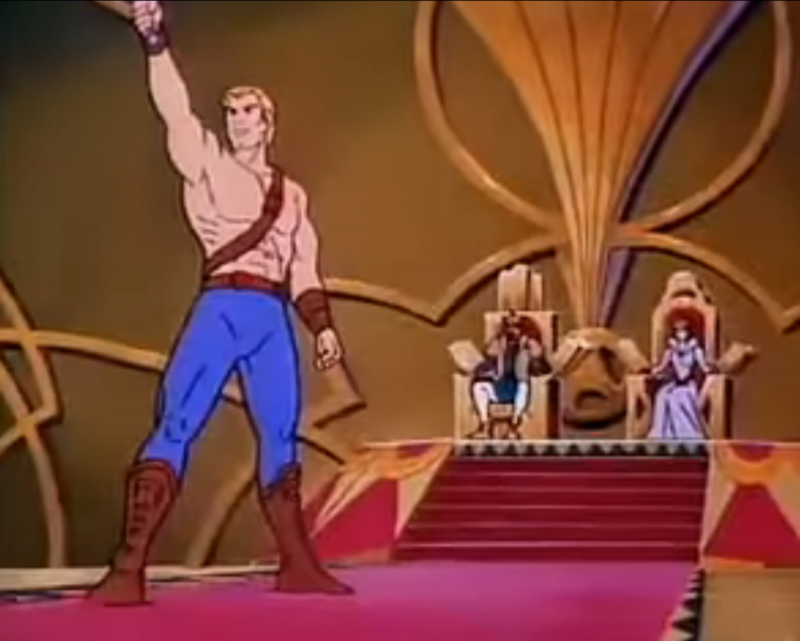 In this canon, a familiar-looking Prince Adam (holding a power sword that looks like Mattel’s 1989 light-up power sword) actually permanently transforms into his new He-Man self in front of Skeletor. 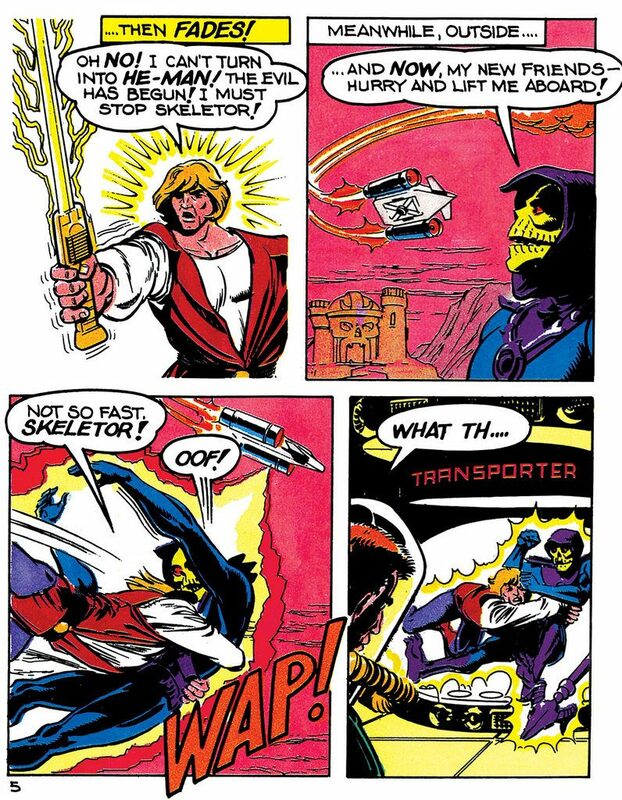 Skeletor had tricked Hydron and Flipshot into transferring the power of Castle Grayskull into their ship. 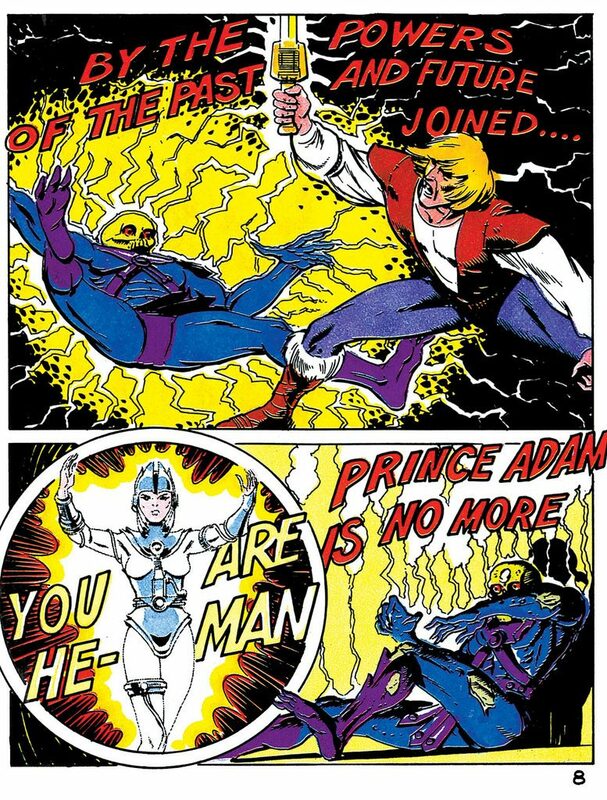 Skeletor planned to hyjack it and take the power for himself, but Prince Adam stops him, and permanently transforms into his futuristic-looking self on the ship. 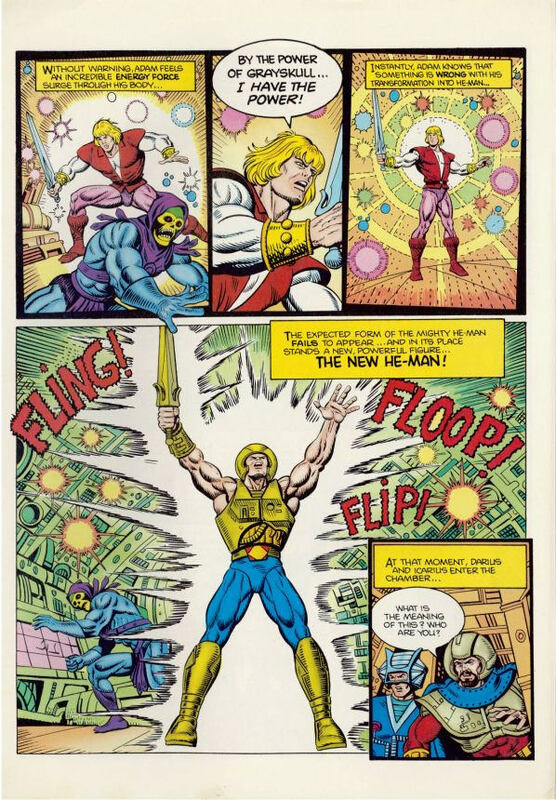 On the cover of The New Adventure, He-Man wears his helmet and armor, but otherwise he goes without these accessories for the rest of the short series (images are from Dark Horse’s He-Man minicomic collection). 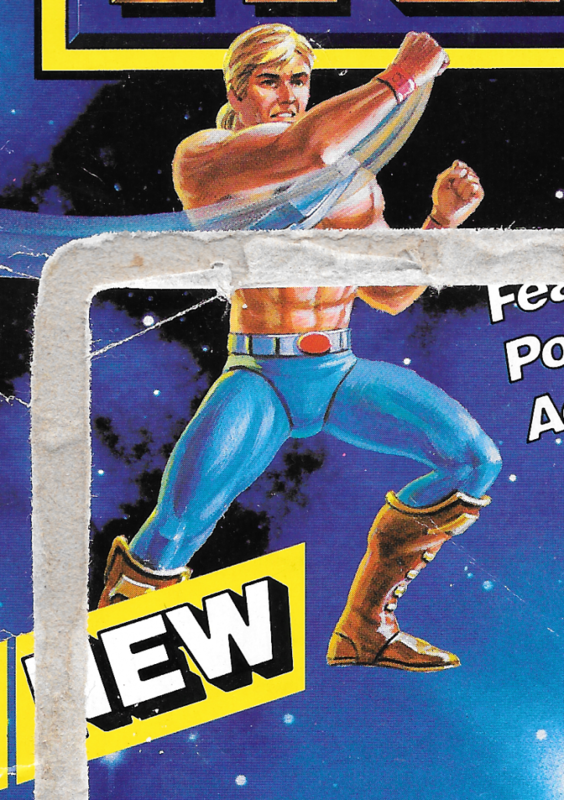 So, finishing my thought from earlier in the article – what to make of this radical He-Man redesign? I have to say I like the design overall, but I think it was a mistake. 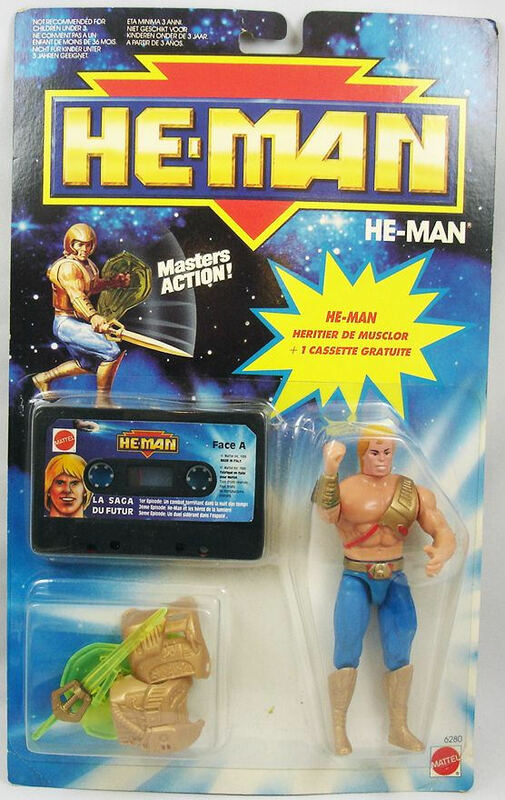 Without the label on the package, no kid would have looked at this figure and guessed that it was supposed to be He-Man. 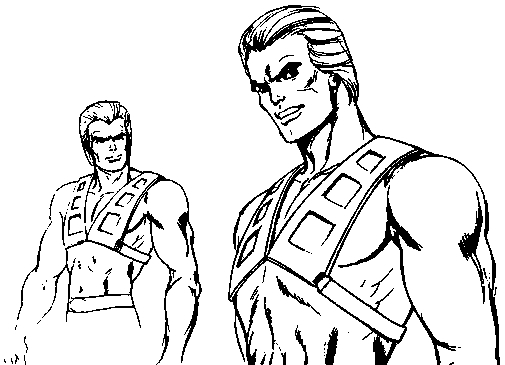 There should have been some kind of call-back to the original character, beyond just giving him blonde hair and a sort-of similar face. He should have retained some of his original colors – gray, red and orange. He could have retained the helmet and chest armor (ideally in silver or gray), but underneath there could have been the usual X-shaped harness with either an H or a cross symbol, with some futuristic embellishments. 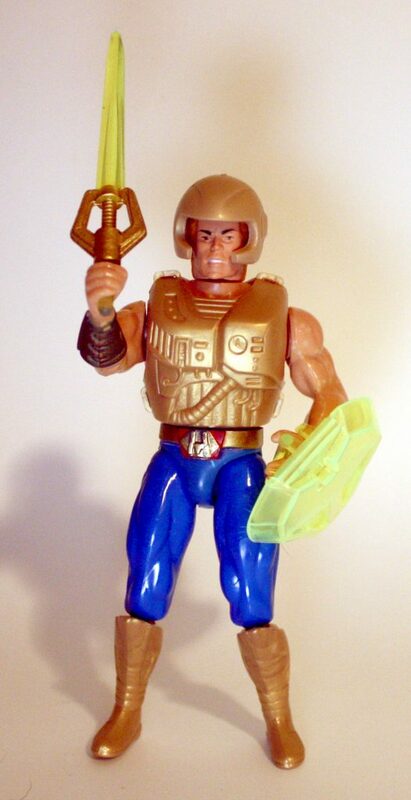 We needed something to tell us that this was not just future space man, but future space He-Man.